The Goderich Port Management Corporation (GPMC) conducted a study under the Environmental Assessment Act to expand wharf facilities in Goderich Harbour in order to increase usable off-loading and on-shore storage area and to provide greater shelter within the harbour. The detail design, includes an expanded wharf located within the existing northern breakwalls of the outer harbour. Construction will occur in phases, with the initial creation of a single slip. On February 16, 2011, the Minister of the Environment approved the Terms of Reference (TOR) for the Goderich Harbour Wharf Expansion. On November 14, 2014, the Minister of the Environment approved the environmental assessment (EA), subject to conditions. The PIC will consist of an informal drop-in open house, with no formal presentation. Members of the public, agencies and other interested persons are encouraged to actively participate in the planning process for this undertaking by attending consultation opportunities or contacting staff directly with comments or questions. c/o Lavis Contracting Co. Ltd.
GODERICH, Ontario (Dec. 16, 2014) – The Goderich Port Management Corporation (GPMC) received approval of the Environmental Assessment submitted for the proposed Goderich harbor wharf expansion. The Port of Goderich is the only deepwater port on the east shore of Lake Huron. Servicing regional mining, manufacturing and agricultural industries, the Port is an important hub of commercial shipping in southwestern Ontario. Approximately 250 ships dock within the Port of Goderich annually, loading and delivering commodities such as salt, grain and calcium chloride. Currently, the Port is unable to accommodate new users who wish to bring in other commodities such as aggregates, due to limited storage space. In addition to limited loading/unloading and storage space, there are issues with the configuration of the existing harbour. In 2006, a Harbour Rehabilitation Master Plan identified problems with sediment deposition and exposure to wind and wave action in the Harbour. structural improvements to the break walls and piers that will offer improved wave protection. “The announcement of the Environmental Assessment Approval for the Goderich Port is great news for the Town of Goderich,” said Goderich Mayor, Kevin Morrison. “This is a major project milestone and a significant step toward the expansion of the port facilities. The construction phase over the next two to three years will provide employment and will be a positive effect on the economy of Goderich and the surrounding area. The prospect of new uses in the Port once the project is completed is welcomed news for our community. The project has partial funding in place from the Province of Ontario and now requires a financial review of the defined construction costs to ensure that the investment still makes economic sense for the project investors. With that in place construction can begin construction as early as March next year. The Port of Goderich is owned by the Town of Goderich and administration of the Port is overseen by the Goderich Port Management Corporation. Goderich Port Management Authority has received the Notice of Approval to Proceed from the Ministry of Environment and Climate Change, for the Goderich Harbour Wharf Expansion Environmental Assessment. The Ministry completed its review of the Environmental Assessment and has approved it, subject to conditions. The Notice of Approval is available for viewing on the GPMC website on the Public Notices page. The environmental assessment for the Goderich Harbour Wharf Expansion is now available for public review. A digital copy of the report documents are available on this website under the Individual Environmental Assessment page. Copies are also available for viewing at the Goderich Municipal Office and Goderich Library. Goderich Port Management Corporation has completed the environmental assessment for the proposed wharf expansion at the Goderich Harbour. As required under section 6.2(1) of the Environmental Assessment Act and according to the terms of reference approved by the Minister of the Environment on February 16, 2011, the Goderich Port Management Corporation has submitted its environmental assessment to the Ministry of the Environment for review and approval. The twin-slip wharf expansion will provide two additional docking spaces, maintain the existing Dock 7 and create an additional 6.3 ha of loading/off-loading and storage space for salt, aggregates and other commodities. The wharf configuration will also provide greater shelter from wind and wave action in the outer harbour. The wharf expansion will consist of a rock and earth infill contained within sections of the existing south river wall and north break wall in the outer harbour. The eastern portion of the expanded wharf and dockwall will consist of continuous cells of steel sheet piles, sheet piles with deadman anchors or concrete caissons. The western portion of the expanded wharf and dockwall will consist of steel sheet pile cells which will also serve as mooring dolphins and be connected to the wharf by interconnecting foot bridges. No improvements to North Harbour Road are proposed at this time. The intersection of North Harbour Road and Highway 21 will be monitored as the wharf expansion transpires and additional warning devices will be implemented when warranted by Ministry of Transportation requirements. As required under the Environmental Assessment Act, the environmental assessment will be available for public review and comment from February 21, 2014 to April 11, 2014. Monday to Friday 10:00 a.m. – 8:00 p.m.
Sunday 1:00 pm – 5:00 p.m.
A copy of all comments will be forwarded to the proponent for consideration. The Goderich Port Management Corporation (GPMC) is conducting a study under the Environmental Assessment Act to expand wharf facilities in Goderich Harbour to increase usable off-loading and on-shore storage area and to provide greater shelter within the harbour. The proposed twin-slip wharf design includes a 7.9 ha expansion within the existing northern breakwalls of the outer harbour. Some minor improvements to North Harbour Road are also being considered. Time: Thursday, June 13, 2013, 3:00 p.m. to 7:00 p.m. Details: Dinner and prizes will be provided. The Goderich Port Management Corporation (GPMC) is conducting a study under the Environmental Assessment Act to expand wharf facilities in Goderich Harbour in order to increase usable off-loading and on-shore storage area and to provide greater shelter within the harbour. The technically preferred design, the twin-slip option, includes an expanded wharf located within the existing northern breakwalls of the outer harbour. Some improvements to North Harbour Road are also being considered. The PIC will consist of an informal drop-in open house with a brief presentation at 7:00 pm. The PIC will be an informal, drop-in open house, with a brief presentation at 7:00 PM. The Goderich Harbour expansion project is entering into the environmental assessment (EA) phase, and Grant Kauffman of LGL Environmental Research Associates said the task at hand is to capture the current conditions of harbour life. "We're in the process of doing technical studies," he said. "(Describing) existing air quality, noise, natural heritage, land use and transportation." A notice of study commencement was printed in the November 2 Signal-Star – something Kauffman refers to as the formal kickoff for the individual EA process. Once the base studies are completed, the potential impacts of wharf expansion will be examined. As part of the EA Act, one of the components of the study is to examine and provide alternatives to HADDs – harmful alterations, disruptions and destruction. "We're looking at alternative sites where the wharf expansion could occur," Kauffman said. "Then we can begin evaluating." Alternatives need to be studied for size, layout and construction of the project, which aims to infill 14 acres of land off the north harbour. While Kauffman said there are different areas identified that could be used for the expansion, they all involved infilling. Rather, he said, it's the location of the infill that LGL and BM Ross are examining. Challenges unique to the infilling include navigation, fisheries, shoreline, curents and people in proximity to the harbour. "These are all parts of the study we're doing," he said. "But then there is the other aspect of it – noise, dust - all have to be addressed"
There are two study areas for the EA, the primary area includes the harbour itself and North Harbour Road – already in need of improvements for port access. The secondary study area expands beyond that both on land and in the lake itself. A map of the study areas was also included in the notice of study commencement. The target date for completing the EA is December of 2012, after which Kauffman said the government review stage could take from 4-6 months. The full Terms of Reference, which sets the groundwork for the EA, is available online through the Goderich Port Management Corporation at: goderichport.ca. For interested public, there will be at least two public information sessions during the study, conducted in a drop-in, open house style. There, the public can ask questions of the technical experts working on the EA. Once the study is completed, the public will have a chance to review the EA and Kauffman said, to influence the final decision. It is a far cry from the $1,600 first paid by Samuel Platt in 1866, but the $47 million dollar expansion of the Goderich Harbour will finally be a reality thanks to a public/private partnership between Sifto Salt, the Goderich Port Management Corporation and the Provincial government. In making the announcement Thursday, June 30, Huron-Bruce MPP Carol Mitchell thanked the tireless efforts of GPMC President Al Hamilton, Mine Manager Rowland Howe, Goderich Mayor Deb Shewfelt and CAO Larry McCabe. "After four years of working with the town and Sifto and the port corporation, we have finally delivered on our commitment," Mitchell said. "Providing $15.7 million for improvements and expansion to the Port of Goderich." The remainder of the money will come from Sifto and from increased wharfage fees and will not affect the municipal tax base at all. All told, six new hectares (15 acres) of land will be created off the north harbour, as well as two new loading terminals and improvements to other infrastructure, including breakwalls and some work on North Harbour Road. The increased capacity will allow for the agriculture, mining and aggregate businesses to ship more by sea, and will create more than 500 construction jobs, and 150 new, local jobs. "This is our window to the world for all these good things grown and mined in Ontario and Huron-Bruce," Mitchell said. It's been 13 years since the acquisition of Goderich Harbour from the federal government, said Mayor Deb Shewfelt, and a new chapter is about to be written on the very same harbour that helped incubate the Town of Goderich. "The harbour played a part in the development of the whole area," he said. "Generations will look back and see this day as the start of a bright future." What helped make the project a win-win, he said, was the goodwill from all sides of the bargaining table, noting the long hours that went into negotiating the agreement. Though it was long, hard work, everyone did their part. "I think it's been very stressful," he said. "There are a lot of parties involved. Any areas that were obstacles we have always been able to surmount them." A key negotiator in the project, Howe gave credit to the town for "actively supporting a program of renewal and investment," in the harbour. The new infill will allow Sifto to take full advantage of their new storage facility, moving more tonnage of salt and taking trucks off the road. "This is a path to get goods to a market that is underutilized," he said. The mine will have lease options on the new property for 25 years, and will use the storage year-round. GPMC President Hamilton said the operating structure of the port has worked well for the past 13 years, and saw Thursday's announcement as a way to move forward with it. 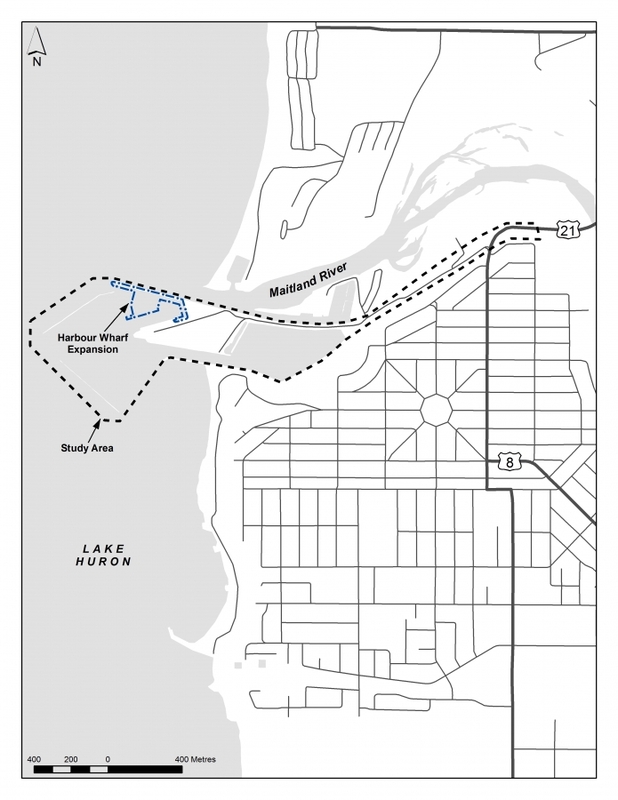 "It's a great place for people to move cargo through the area," he said, adding the new space will also help attract new users to the only sea-depth port on this side of Lake Huron. Town CAO McCabe, who worked hundreds of hours on the project over the past two years, said the announcement is the result of strong partnerships. "We had the history and the ability to partner and make this happen," he said. "We've proven we could make this a reality." While it will take some time to gather the materials and complete the necessary studies, construction could begin within the next two years. Some environmental assessment work is already completed for the break wall and piers, leaving most of the physical work. The 47-million dollar harbour expansion in Goderich is now ready to proceed. Huron-Bruce M-P-P Carol Mitchell announced the province's 15.7 million dollar share of the funding this morning. The other partners are the Goderich Port Management Corporation and Sifto. Al Hamilton is President of the Goderich Port Management Corporation and says the expansion will provide several benefits, starting with the addition of fifteen acres of land. Hamilton points out the land will be primarily to allow Sifto to expand its operation but will also attract new businesses to the port and that will mean new jobs.